Spacesmith’s challenge was to design a space that functionally met the needs of its software designer users, and reflected a restrained and timeless aesthetic. The open floor plan is located between two expanses of window walls which provide the best views. Ten foot corridors along these walls with wood slat ceilings are provided with high back lounge seat groupings that provide acoustic privacy so that staff can have informal meetings and make personal calls. Amenities provided include multiple glass-enclosed meeting rooms, a café, and a creative room. The few offices in the space have glass fronts to encourage accessibility between leadership and staff. The design palette of the space consists of light neutral colors with touches of vibrant color in the café and creative room. The 49th floor floor plate enjoys views on three sides of New York City all the way to the Statue of Liberty. 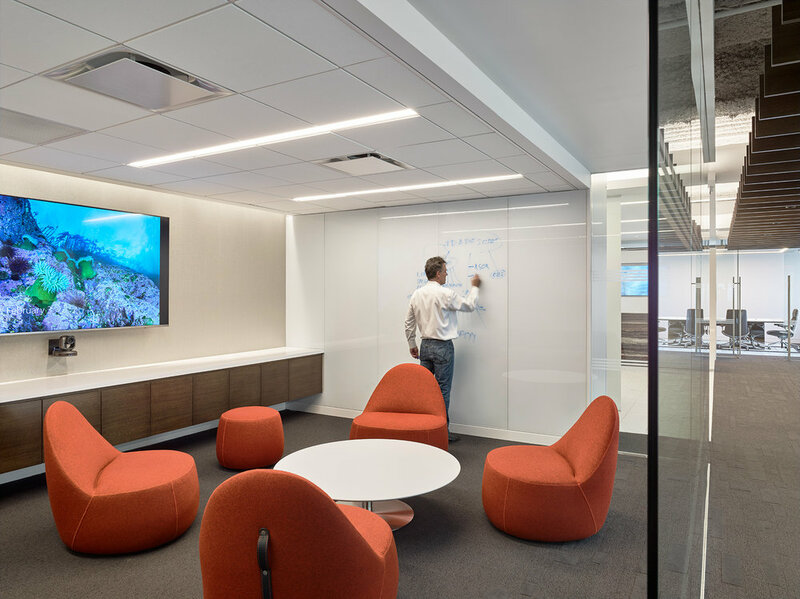 The design and construction of TradingScreen’s new workplace began as we were out of space in our former offices and the look, feel, and usability of those offices were no longer consistent with the direction and branding of the firm. We interviewed a number of architectural and workplace design firms and Spacesmith rose to the top based on their understanding of what we wanted and the creative vision needed to get us there. From the very start, Spacesmith was a great firm to work with. Not only did they manage the project but, just as importantly, they managed our expectations. The Spacesmith team knew what we wanted from a design perspective and, when speaking with the general contractor, made sure our best interests were properly voiced and represented. Since moving into our new workplace, we have seen a huge increase in employee engagement and morale. We invested in our new office to give the employees a space that they wanted to come to everyday. The open floorplan gives everyone access to natural light, great meeting spaces and gathering areas, as well as a more personal space which was lacking in our old office. Our new office also provides a great view of southern Manhattan which Spacesmith’s design takes full advantage of from the moment you walk into the space. Visitors love coming here too.